Artificial Intelligence is profoundly reshaping society and is without a doubt one of the most significant technological breakthroughs in recent years. 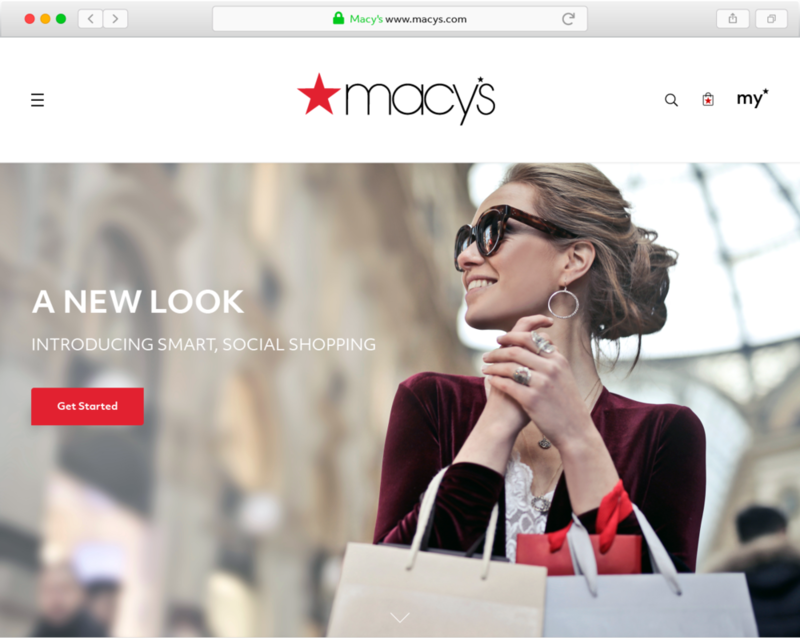 When asked to share my vision of a new shopping experience for Macy’s that was seamless and personally engaging I was certain that I wanted to see how to bring AI into the picture. Macy’s and I were in discussion to work together and this work was produced to show my thinking. Additionally, I was directed to create an experience that assisted customers in product discovery and encouraged repeat visits to macys.com. This set me on a path of thinking how best to leverage computing to achieve this goal. The fun part of this assignment was that it was a vision exercise and allowed me to explore what was possible. I lead creative, UX and strategy for this project producing all creative. I was tasked with innovating and providing thought leadership. This was vision work upon direct invitation from Macy’s within the context of larger discussions of joining Macy’s at a senior design leadership role. My approach was to draw on image recognition, which is AI technology that is quite mature and highly accurate. My research found a success rate in the 90-percentile range. Specifically, my insight and recommendation was to utilize Reverse Image Search. Someone would first identify a product that they are interested in purchasing and then upload a corresponding image to the site. The site’s image recognition engine would in turn process that image and return corresponding product matches from the Macy’s product catalog, simplifying product identification. Given the ubiquity of smart phones and digital cameras, the consumer is well-positioned to take a photo of an outfit that they like. Imagine a few friends are out for the day. They take photos of each other. How cool would it be if they could upload those to find a look that they want to buy. Of course, it doesn’t have to be a friend. We are surrounded by images all day. Celebrities, fashion influencers and images we find online all inspire us. The cool part comes when someone is given the option of making those images public. Needless to say, we all love sharing images with others. Social networks prove this point extremely well. What if you had the option of checking a box to allow your uploads to Macy’s to be shared with others, and you could create a feed of not only fashion that inspires you but of your looks that inspire others. Think of it as a cool mix of Instagram and Pinterest taking place within the context of a retailer's site. Add in the features that we’ve come to love from those platforms—follow, like, direct message, etc. plus the ability with AI to identify merchandise and directly purchase those items. As part of my research I spent some time researching the phenomena of influencers and the power they have through their reach to drive sales. Brands and retailers work directly with influencers these days as an important channel in their sales and marketing. My proposal creates another platform for influencers, both established and up-and-coming ones, to extend their reach. In turn, a site such as Macy’s could leverage their influence to drive sales. In addition to posting on Instagram and other sites, this constituency could increase their exposure by using macys.com and simultaneously drive traffic to the site with their existing base of followers. My vision is to create a social networks dedicated to fashion. Brands and retailers would certainly play a key role as well by sharing their own images and content. What I think is really cool about this idea is that everyday people, you and I, would work in partnership with brands and retailers to inspire other’s to find and purchase the products they love. In turn, our purchases would be driven by people that we can easily identify with. Finally, by allowing customers to generate content they become invested and the challenge of driving repeat visits/traffic is accounted for. When it was time for a refresh of the Louis Vuitton digital platform, I was thrilled to be asked to come to Paris to assist this iconic luxury brand re-imagine how to engage their customers online. The end result is a site that first caters to their brand enthusiast's love of fashion and couture by offering runway/défilé shows each season as well as a variety of news and fresh content in order to ultimately drive e-Commerce sales. This is an international site with localizations for 20 difference countries and multiple languages. The project relies upon the latest in web technologies and is responsive across all breakpoints from large desktop to mobile screen. These images above represent work from the whole team including me. Working in partnership with a leading French agency, I lead UX owning all Experience Design for the project, collaborating with more junior level agency UX staff and reporting to additional stakeholders including a Director of UX and team members from creative, strategy, accounts, etc. When Audi brought to market their dynamic hybrid vehicle the eTron®, I was fortunate to be able to assist with the online launch by designing the UX for their site as well as a proprietary in-dealership application. My approach was to focus on the user by making use of a rich parallax design that was divided into key messaging points for the vehicle including performance, charging, and the environmental benefits. The site relied on videos and animations through the experience to support our goal of creating an immersive, interactive experience. These images above represent work from the whole team including me. Working with an engineering-driven team at a large agency leading UX, I was responsible for all Experience Design for the project. I closely collaborated with the creative team reporting to additional stakeholders including a Director of UX, Director of Strategy, accounts team, etc. I helped Intel® consider how to best connect with consumers as a brand that they interact with directly. The challenge for Intel® is that many PC buyers don't consider the chipmaker when selecting a computer, instead thinking of PC manufacturers such as Lenovo or Dell. To increase brand consideration, I designed a variety of digital experiences for the in-store experience including touch screen displays, mobile apps, a large international digital campaign and physical displays. The fun part of the project was going into different retail environments and conducting guerrilla-style interviews of shoppers and sales people. The former gave me some perspective on what shoppers think of when considering the purchase of a product with Intel® inside and the latter taught me what is needed from the sales person's P.O.V. to make their sale come to fruition. These images above represent work from the whole team including me. I lead UX, tasked with innovating and providing thought leadership within the constraints of a global campaign. This work occurred at a large digital agency in San Francisco and I was part of larger team with a large number of stakeholders. It was my job to closely coordinate with all of the various team members and my direct supervisor while also being the primary UX lead and representative. When Toyota and their US dealers were considering how to best reach out to their customers, I stepped in offering my UX services. The end result after a variety of in-field, ethnographic user research was to design a site that spoke the consumer's language. The site offers price transparency with a novel UI to allow customers to easily visualize which car fits their budget. It also remembers their past use of the site, which curiously is very uncommon among auto sites, among other user-centric innovations. Additionally, as pictured here, I worked on a tablet app that allows customers to walk around the dealership while collecting vehicle information and chatting online with sales staff. This bridge between the analog and digital car buying experience was a key UX recommendation I made. These images above represent work from the whole team including me. I was the principal UX designer working with another senior UX designer and a team of creatives working to find novel solutions that help to modernize the auto industry and to bring it up to date with the latest changes it the digital world. When Visa needed to tell their different constituents about the launch of chip cards in the US I helped out by designing a highly user-friendly site to support the roll-out. The site uses a mobile-first design that is naturally responsive to support a variety of different breakpoints. Messaging is customized to speak to the various stakeholders from consumers to merchants and banks. These images above represent work from the whole team including me. I lead UX, owning all Experience Design for the project. I stepped in to assist on this specific project under the aegis of a larger agency who was producing a variety of creative for Visa and needed additional UX expertise in-house. We met all project goals and the project was a success. What is the User Experience of a credit card? That is the question I was asked by Wells Fargo, one of the leading banks in the US, to answer. To solve this problem I relied upon my UX research methodologies, focusing on understanding the customer journey. I created a highly original user journey document to begin and then moved into wire frames for the various digital channels: desktop, tablet, mobile and even ATM screens. With a good understanding of financial customers' needs I was able to propose novel digital experiences across multiple channels from mobile, web, social, and even offline experiences such as the in-bank experience. Included in my work were designs for native Wells Fargo mobile apps, including one that allowed customers to project how many credit card "More" points they would have if they had started using their card earlier. This was an important tactic for the overall project goals as customers often don't use their cards and our goal was to demonstrate some of the potential benefits of doing so. These images above represent work from the whole team including me. Working under the aegis of a large interactive agency I lead UX, owning all Experience Design for the project. This was a fast moving project in which I was required to quickly come up to speed with a complex sales process and established funnel. McKesson is a large Fortune 500 company that provides a variety of healthcare-related products and services including white label services for independent pharmacies across the US under the Health Mart brand. I was pleased to be able to provide UX design for Health Mart including the design of a flexible Web site template that independent pharmacies can use to create their own site as well as a marketing site for McKesson. Additionally, mobile versions of each were created. One of the challenges for the project had to do with the large size of the organization commissioning the work. The client is ranked Fortune #5 on the list of top companies on this index. Any organization this large has lot of involved stakeholders and a pace proportionate to its size. This translated to a healthy number of revisions for my work. To succeed I worked especially hard on my communication efforts. I made sure that all stakeholders were actively updated on the status of the project and my work. Additionally, my project management skills played an essential role in my success. All told, thanks to these efforts I managed to keep the project on time and within budget. These images above represent work from the whole team including me. This was a direct contract from McKesson, and I was the principal UX person, owning all Experience Design for the project. My activities included collaborating with McKesson marketing staff and additional stakeholders from the client side. Additionally, there were additional vendors on the team that I needed to closely coordinate with. This portfolio showcases work in which I played a significant role. As with all large-scale creative projects, the final work product is part of a team effort. Some individual screens are worked on by more than one person, and there are screenshots of the final product, which was coded by software engineers.